This production opened on March 8, 2014 and closed on March 9, 2014. SMCT’s dinner theatre for March 2014 was an event to remember. The audience has come to say goodbye to Patrick James Finnegan, a mailman who won 2.2 million dollars playing the slots at Atlantic City and then promptly dropped dead. As his contentious family gets more and more distraught during this memorable evening concocted by the co-creator of Tony and Tina’s Wedding, a fight erupts over opening the casket. Finally they do and Paddy’s body is not in there! 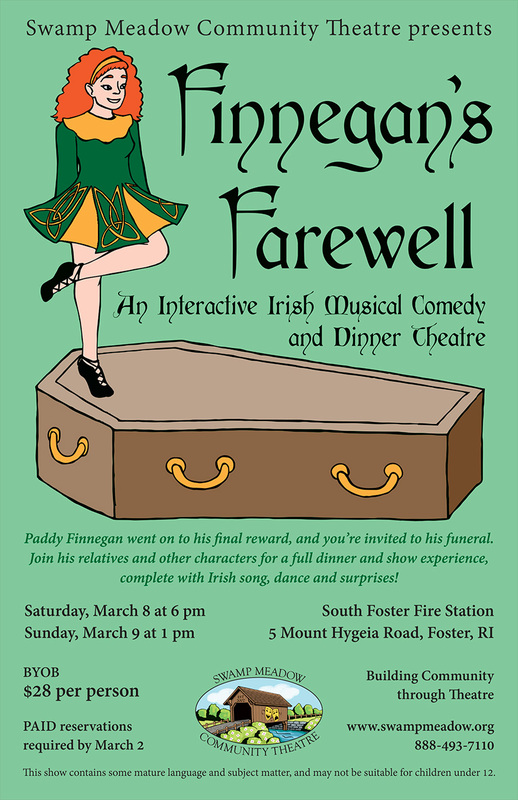 While the missing body is located, the audience is invited to eat, drink and be merry at an authentic Irish American wake, complete with traditional Irish drinking songs and some lively tap and step dancing. Paddy is found, the party continues and all are treated to a great surprise one straight out of the song Finnegan’s Wake. Finnegan’s Farewell was performed at the South Foster Fire Station on March 8, 2014 at 6 pm and March 9 at 1 pm. Tickets were $28 each, including the meal. BYOB.